Created for the U.S. military, the High Mobility Multipurpose Wheeled Vehicle (HMMWV, and more colloquially, Humvee) was engineered as a replacement for the M151 jeep vehicles and other light trucks that were previously the Armed Forces’ primary modes of light-duty transportation. Designed and built by AM General, the Humvee joined the Army—and other U.S. military branches—in 1984. Eight years later, in 1992, a civilian version was made available for retail sale. Made popular in part by its role in Operation Desert Storm, the Humvee enjoyed a certain amount of popularity among military aficionados as well as serious off-road enthusiasts. Between 1992 and 2000, the Humvee was marketed as the AM General Hummer. For 2001, thanks to a marketing agreement between AM General and General Motors, the truck was rebadged the Hummer H1, effectively launching the Hummer brand. The H1 continued to be produced by AM General at its Mishawaka, Indiana production facility, which would also assemble the Hummer H2 for GM. The H1 was dropped from the Hummer lineup after 2006, though AM General continued to produce military versions of the Humvee through 2018, when it was replaced by the Joint Light Tactical Vehicle designed by Oshkosh Vehicles. 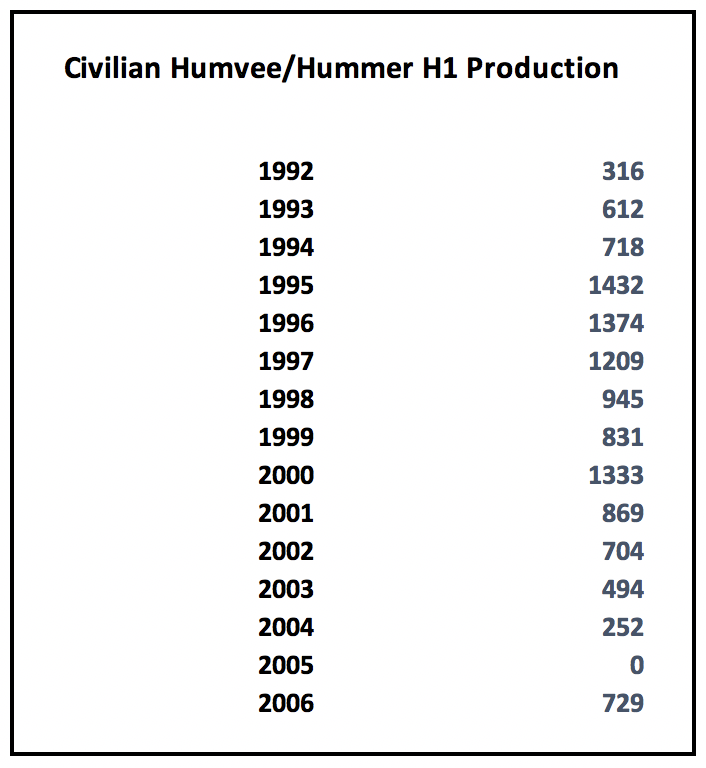 Despite its seeming ubiquity and prominence in pop culture during its life cycle, the Humvee/H1 was produced in relatively small numbers. Given the vehicle’s scarcity, and near-legendary off-road prowess, it stands to follow that the vehicle would enjoy a cult-like following today, and it does. 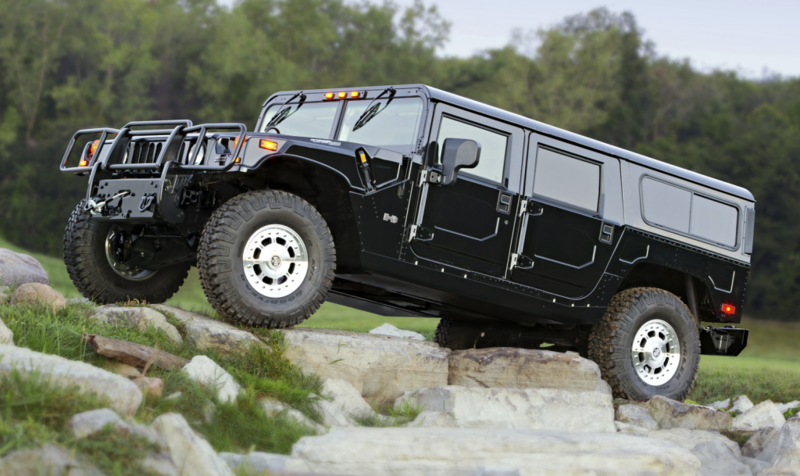 Hummer H1 asking prices regularly exceed $100,000, with the rare 2006-only H1 Alpha commanding especially high prices. The H1 Alpha is especially coveted for its use of GM’s refined, high-torque Duramax diesel engine, which cranked out 520 lb-ft of torque—80 more than the relatively crude 6.5-liter diesel it replaced. Note that in addition to civilian production, retired military-spec Humvees are made available for public sale and auction. These vehicles often sell for less money than the better-equipped civilian models. One company reselling Humvees for the government is GovPlanet; you can check out their merchandise here. What follows is Consumer Guide’s original review of the 2001 Hummer H1. If you’ve ever spent time with a Humvee or Hummer H1, please tell us about it. The place to leave comments is down below. AM General started selling civilian version of U.S. Army’s runabout vehicle in 1992. Last year, AM General was purchased by General Motors. While we classify the Hummer H1 as a full-size sport-utility vehicle, it is actually a Class 3 truck. This means that it has a gross vehicle rating of over 10,000 pounds and does not have to meet all safety guidelines mandated for smaller vehicles (for instance, it has no airbags). Hummer H1 comes in four body styles: 2-dr and 4-dr hardtops, 4-dr convertible with pickup-type bed, and 4-dr wagon with enclosed rear cargo area like a conventional sport-utility vehicle. All 4-dr models seat a minimum of four people in two front bucket seats and two rear bucket seats. The 2-dr has only front buckets. 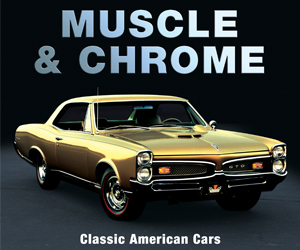 The lone powertrain is a GM-built 6.5-liter turbodiesel V8 and a 4-speed automatic transmission. ABS is standard as is a 4WD system called TorqTrac4 that can be used on dry pavement. Options include run-flat tires, CD changer with Monsoon audio system, 12,000-lb winch, and highway touring tires. The optional central tire inflation system allows drivers to inflate or deflate the front and rear tires from inside the vehicle. Barely adequate around town, and passing power and highway acceleration are well below average. Our test 4-dr averaged just 10.7 mpg. The firm ride is never bouncy and filters out all but the worst bumps. Being eight inches wider than a Ford Expedition, it takes a while to feel comfortable threading the Hummer through urban traffic. Small windows and thick roof pillars don’t help, though large mirrors with wide-angle segments do. Despite a fairly tight turning radius for its immense size, pulling into parking spaces–or even a garage–can be tricky. Body lean is very well controlled. Steering is surprisingly light at low speeds and more accurate than on some smaller SUVs. Brakes activate with so little pedal travel as to be almost touchy. ABS works well. Passengers are assaulted by engine noise at all speeds and wind and road noise add to the din at highway speeds. Most gauges are within clear view, but controls are haphazardly placed; for instance, headlight and wiper switches are on lower part of dashboard, where they’re easily confused with other switches. Oil pressure gauge and some warning lights went haywire on our test vehicle, a problem a dealer service manager said was linked to a new gauge cluster and wiring used on 2001 Hummers. Seats are upright and buslike with only adequate leg room all around. Massive driveline tunnel leaves little elbow or hip room. Step-up into interior is one of the highest in full-size sport-utility class, and tall door sills make things even worse. As in front, rear seats are upright and elbow/hip room tight for such a large vehicle. Cargo space varies with model, but is generally less than expected because the huge driveline hump protrudes all the way to the rear axle. Interior storage is scant, and what’s there is hard to access. With options, our Hummer H1 hardtop listed for over $106,000, an outrageous sum for such an impractical, uncomfortable truck. Hummers have their place as specialty off-road vehicles, but are little more than a vanity purchase as everyday transportation. 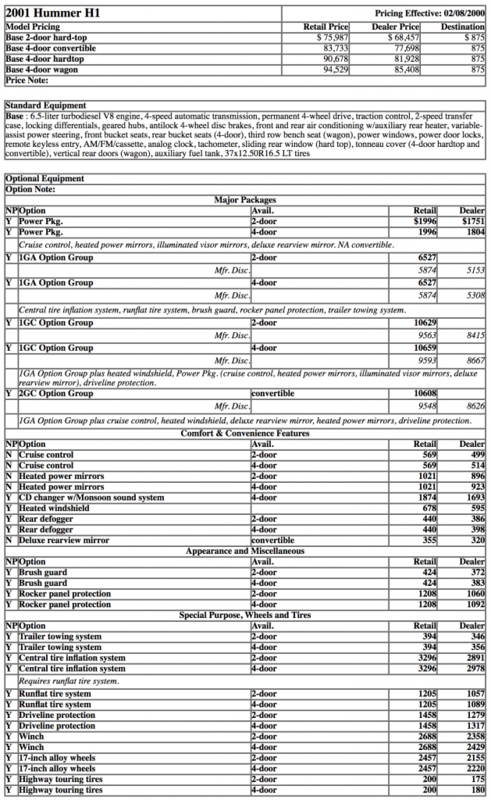 Hummer H1 payload capacity ranges from 3146 lbs. on 4-door wagons with a GVWR rating of 10,300 lbs to 4,300 lbs. on 2-door wagons with a GVWR rating of 10,800 lbs. Hummer H1s with a weight-carrying hitch can tow up to 5000 lbs. Models with a weight distributing hitch can tow up to 8300 lbs. General Motors recommends that you not tow more than 5000 lbs. off-road. Though this segment has cooled somewhat with the rise in fuel prices, it’s still one of the hottest. Our Best Buys include the Chevrolet Tahoe, Ford Expedition, and GMC Yukon. We love the size, comfort, and power of these big SUVs. 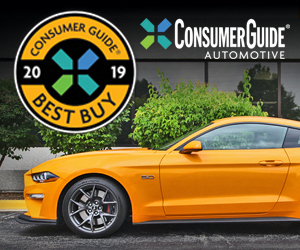 The GM models get the nod in overall ratings, but shop and compare both before you buy. For a few more bucks you can get the Recommended Toyota Land Cruiser. Its high price is the only thing holding back this refined and drivable SUV. Written by: Tom Appel on April 9, 2019.on April 10, 2019.